The idea for a food diary was inspired when one of my close friends from home asked me what the food was like in Germany. She wanted to know what the traditional dishes were, how they were served, etc. I did my best to describe the food, in terms of what it looked like or what it might be similar to in Canada to which she replied, “I need pictures!” I promised I would start photographing my food and put together a little diary to satisfy her craving. While I have started to do this for the German food, I have yet to sample all of the important dishes, so the German food diary has yet to be compiled. However, I went to Prague, Czech Republic this past weekend and as I only had 2 and a half days to sample ALL of the traditional dishes, I did my best to try plenty of different things. While I would like to say that I just loooove to try new food, it’s really not true. I know what I like and when it comes down to choosing something I know I will definitely like or something new that I am not overly sure about, time and time again, I’ll go with what I know. It’s the reason why my German food diary is so far behind. I am not the biggest pork fan, but I do love the German Weiner Schnitzel and I choose it every time we go out over the other pork dishes. I always try a bite of Matt’s pork dish but I am always happy that I ordered the Schnitzel instead. 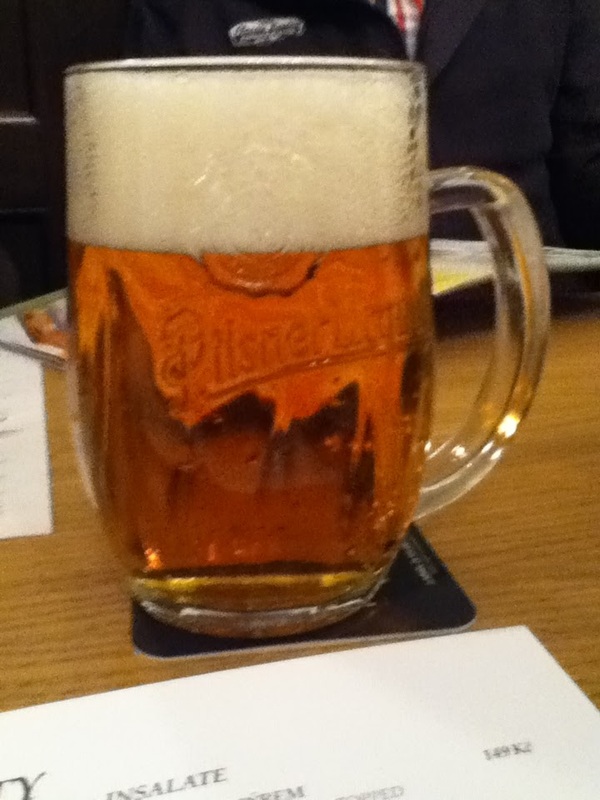 But when I only had two and a half days in Prague, I thought of my friend and how she would want photo evidence. 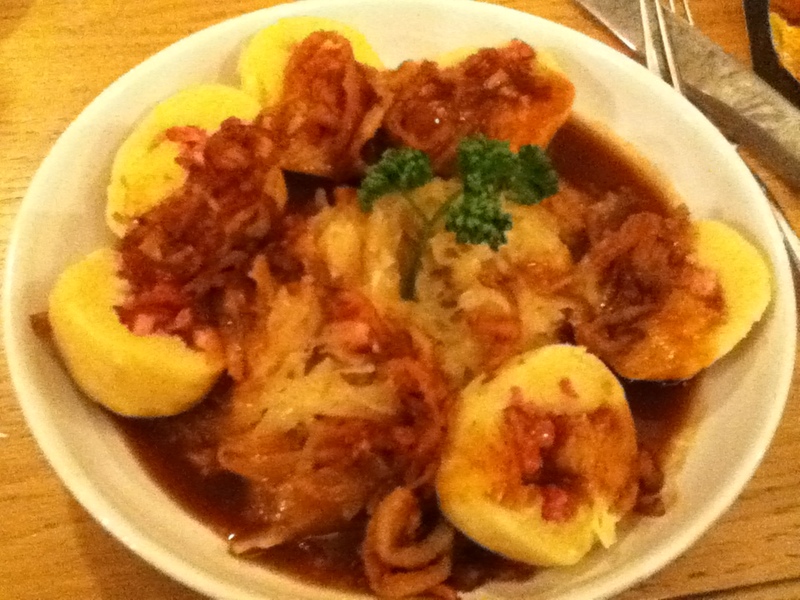 So while the Weiner Schnitzel is a popular Czech dish, I opened my mind to new food and left the schnitzels for Germany. …oh and I also managed to snag a few photos of the dishes that I might have been willing to try as well, just for her pleasure, so she could get the full picture. And so, without further adieu, here it is, a photo diary of all the Czech dishes I opened my mind to this past weekend, and a few of the others I might have if I could have spread it out over a week. I dedicate this post to Julia. 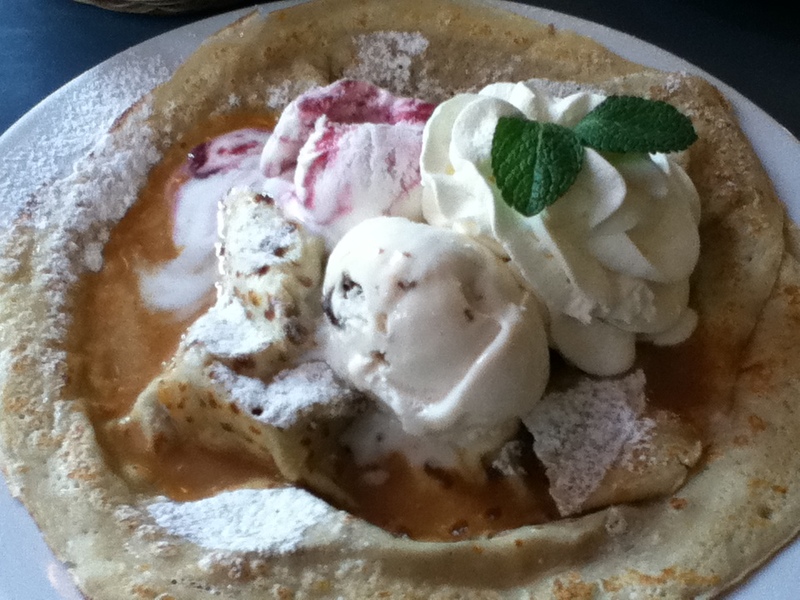 Pancake with ice cream, fruits, whipped cream, caramel, and nuts. I am not sure how "Czech" this dish is, but it's what I had for breakfast the first morning. It's what was on the menu at the traditional Czech food restaurant. It's also actually a crepe, but the menu said pancake. The fruits are hidden underneath and consisted of: pineapple, grapefruit, and something else that was a bit sour. These are my least favourite fruits, but the ice cream was good! The dumplings are not quite what I expected, but they were pretty delicious, and they did an excellent job of soaking up the beefy sauce. Unfortunately, I was really sick during my weekend in Prague, having picked up a stomach virus from the kids. The stomach pains I had during this meal were fairly awful and I really just wanted to lie down at the table. It's one thing to have to force down a bad meal, but it's really sad trying to force down something so delicious. 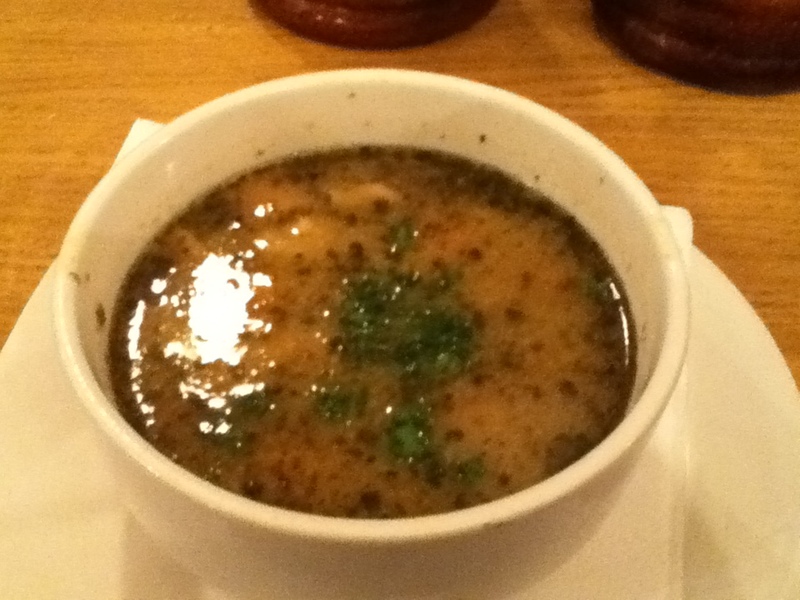 South Bohemian cream-of-potato soup with mushrooms. The soup was delicious. This dish was recommended by our tour guide, something her mom use to make when she was a little girl and something she still makes at home today. I was feeling much better by this point, and I enjoyed every last drop. Potato dumplings stuffed with smoked meat, cabbage, and bacon. The potato dumplings are a lot heavier than the bread dumplings and I was only able to eat 3/4 of the meal. It also left me feeling very full and was the last Czech dish I was personally able to ingest. Of course we can't forget that the Czech Republic brews some excellent beers and that they should be ordered with your meal. 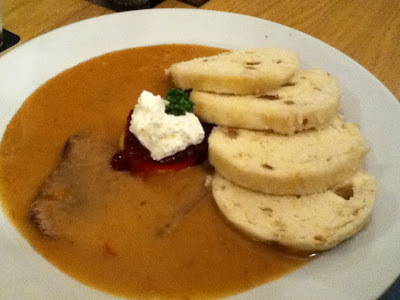 Roast beef with cream sauce and bread dumplings. 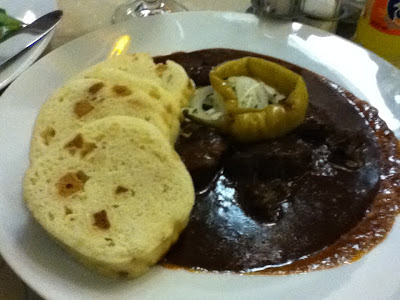 Somewhat similar to the Beef Goulash I had, this is a dish that Matt ordered. The bite I had was delicious. 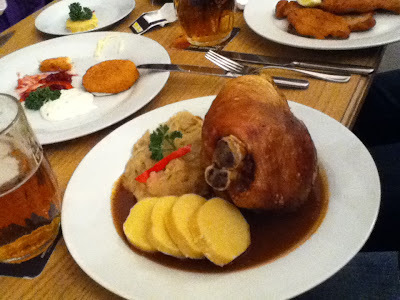 Pork Knuckle with bread dumplings and sauer kraut. Ya, that's a BIG PIECE OF PORK! I don't know the guy who ordered this, but he was part of our tour group and we all ended up sitting together for lunch afterwards, so I asked if I could photograph his meal. The outer shell all sort of came off in one big piece and he didn't think his stomach would be able to break it down, so he just ate the pork inside. He said it was good. Overall, I ordered THREE THINGS that I wouldn't have normally ordered and really enjoyed them all.